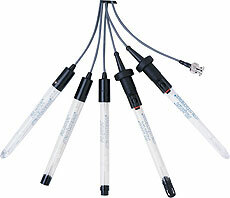 OMEGA Engineering is pleased to offer the ALpHA® Series of pH electrodes. The special internal design allows rapid, stable readings to be taken even during large temperature shifts. The double junction construction prevents silver ions from contacting the sample, eliminating reactions with heavy metals, sulfides, and proteins. ALpHA Series electrodes are available in a variety of styles to suit a wide range of applications. The low maintenance sealed designs are economical and easy to use. Their porous polyethylene junction resists clogging and provides good chemical compatibility with many solutions. The refillable ALpHA® Series electrodes have a unique spring-loaded knob that opens the sleeve junction to provide fresh reference fluid. The refillable style also has a twist-seal refill hole that opens by simply turning the collar, making the refilling process less awkward. ALpHA® Series pH electrodes are available in epoxy body and glass body styles. The epoxy model is used for applications that require a more rugged electrode; the glass style offers a better range of chemical compatibility. All ALpHA® Series electrodes can measure the full 0-14 pH scale (0-12 pH without sodium ion error) and can withstand temperatures from 0 to 100°C (32 to 212°F). PHE-4810 Sealed with an epoxy body and removable bulb guard. Suitable for general laboratory applications that require a double junction style. PHE-4815 Sealed with a glass body. Suggested for applications similar to the PHE-4810, but with broader chemical compatibility. PHE-4821 Refillable electrode with epoxy body and removable bulb guard. Suitable for samples that can cause junction fouling. Also features Rapid Renewal Junction. PHE-4830 Sealed, with a flat measuring surface. Suitable for measuring semi-solids, slurries, and viscous materials. PHE-4841 Refillable with a glass body. Suggested for similar applications suited to the PHE-4821, but provides better chemical compatibility. Rapid Renewal Junction feature. Epoxy body, sealed, with removable bulb guard, 150 mm (6") length, 12 mm (.47") Dia. Glass body, sealed, 150 mm (6") length, 12 mm (.47") Dia. Epoxy body, refillable, with removable bulb guard and Rapid Renewal Junction, 150 mm (6") length, 12 mm (.47") Dia. Epoxy body, sealed, with flat measuring surface, 150 mm (6") length, 12 mm (.47") Dia. Glass body, refillable, with removable bulb guard and Rapid Renewal Junction, 150 mm (6") length, 12 mm (.47") Dia. 참고: Comes complete with 750 mm (2.5 ft.) of cable w/BNC connector and Electrode Care Instruction Sheeet.